Objective – Students will recognize the work of George Rodrigue and be able to draw a “Blue Dog” in any environment they choose. Procedure - Read the book Blue Dog by George Rodrigue. 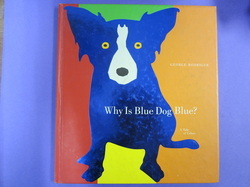 Discuss all of the different colors and backgrounds in which Blue Dog is drawn. Have the students draw their dog in the background of their choice. Step by step instructions are modeled. Use an oval for the body, head and nose. Then use ovals for the feet and a bent triangle for the tail. Next use triangles for the ears. Crayons are used for coloring the picture.